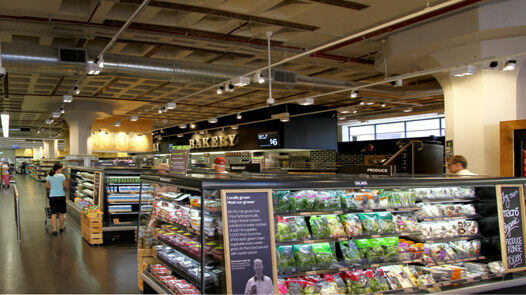 Breaking away from the traditional 4000K option, this store utilised a warmer 3000K colour temperature which immediately separated itself from the traditional supermarket feel. The store was designed with a layered lighting effect, utilising the XT52 fitting for general lighting and the XTS26 fitting for highlighting. This balance of high and low intensity lighting provides contrast to key focal areas. The varied intensity levels, working in harmony with the warmer colour temperature provide a more relaxed, upmarket ambience not normally found in supermarkets.